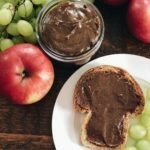 It only takes 5 ingredients to make this delicious hazelnut spread! The best part about these ingredients? They all have amazing health benefits! Preheat oven to 400F. Start by roasting your hazelnuts. Place them on a baking sheet in the oven and roast them for about 8-10 minutes. Make sure to shake the baking sheet halfway through, so the hazelnuts don’t burn. Remove them from the oven and let cool. Once the hazelnuts have cooled, place them in a food processor and blend them until they come to a “peanut butter” type texture. This will take about 10 minutes. You’ll have to scrape down the sides during this time to make sure all of the hazelnuts are blended. Stop the food processor and add in the honey, cacao powder, coconut milk, and vanilla. Turn the food processor back on and mix until everything is blended together. This will only take a couple of minutes. Transfer the mixture to a jar and keep in the fridge. Enjoy!